p 11 www.puyallupparksandrec.com Youth/Specialty Programs Safe At Home Learn to respond safely to a variety of situations when direct parental supervision is unavailable; includes role-play door/ visitors, phone, gun, internet, house key, and personal safety. Some first aid and family communication is covered as well. Instructor: Jaque Martinson Ages: 8-12 When: Saturday, May 26, 2-4pm Where: PRC/CENT Fee: $36 Resident Discount: $30 Super Sitter's Babysitting Course Do you want to be a super babysitter? Then you'll want to join us for a day of fun while learning important babysitting skills like supervision and play with children of various ages, basic first aid, safety precau- tions, accident prevention, and emergency skills. Bring a sack lunch to class. Register early as class fills quickly. Instructor: Jaque Martinson Ages: 11-16 When: Saturday, May 26, 9am-2pm Where: PRC/CENT Fee: $72 Resident Discount: $60 Work for Puyallup Parks & Recreation We are always looking for creative, new ideas for classes that we can offer the citizens of Puyallup and the surrounding area. Do you have a passion, talent, or skill? Do you want to teach others about your area of expertise? Give us a call or send an email to get information on becoming an employee or independent contractor with the City of Puyallup. Contact: Tyler Eidson, 253-770-3325 or teidson@ci.puyallup.wa.us Comeback Club The Comeback Club is a social/recreational group for adults who have experienced a traumatic brain injury (due to illness or accident). 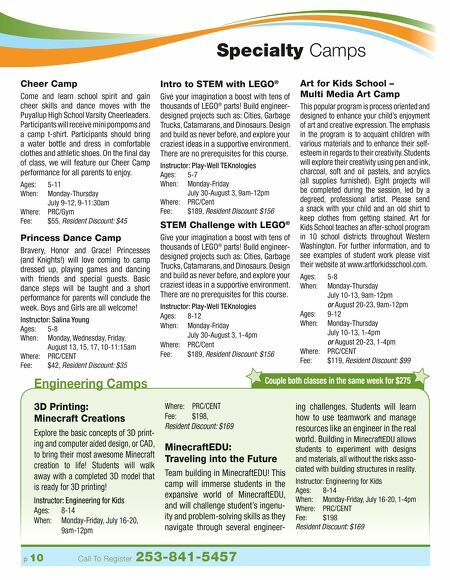 Activities include social games, board and table games, cards, crafts, theme nights, and monthly community outings. Family members/caregivers are welcome. Call for specific weekly schedule plans. Instructor: Sue Bender & Susie Sarachman Ages: 18 & Up When: Every Monday, 6-8pm Where: PAC/1 Fee: Free Want to volunteer? Call Tyler Eidson: 253-770-3325 V.I.P. 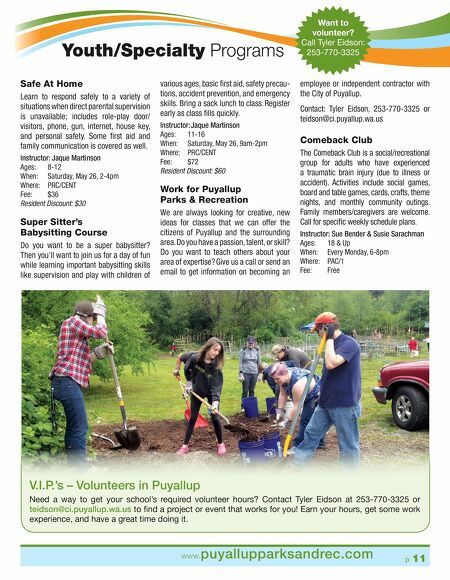 's – Volunteers in Puyallup Need a way to get your school's required volunteer hours? Contact Tyler Eidson at 253-770-3325 or teidson@ci.puyallup.wa.us to find a project or event that works for you! Earn your hours, get some work experience, and have a great time doing it.